A few weeks ago, I made a trip to the magical Land of the Thunder Dragon, Bhutan! I say magical because this is a place with so much to offer – serene and scenic landscapes, art, religion, culture, and of course, because it happens to be one of the few countries in the world that is still ruled by a King and a Queen. 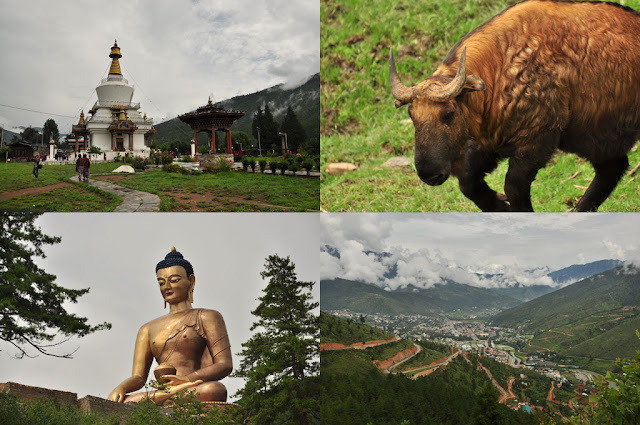 I travelled with a friend to Bhutan for 6 days (from August 15-20, 2012), and we visited the two main cities of Thimphu and Paro. This post is a detailed account of our trip, and I have also included some useful travel/accommodation information for those of you who intend to plan a trip there yourself. The Drukair flights to Paro in Bhutan were very expensive by the time we finalised our travel plan, so we decided to take an alternative route: we travelled to Bagdogra (Siliguri) by flight, and then entered Bhutan by road via the border town of Phuentsholing. We lost two sightseeing days in the process, but we also reduced our flight costs by more than half! Our flight from Hyderabad departed early in the morning at 6:30 AM. It was a 2-hour journey to Bagdogra Airport, and we took a prepaid taxi from there to the Mittal Bus Stand in Siliguri. 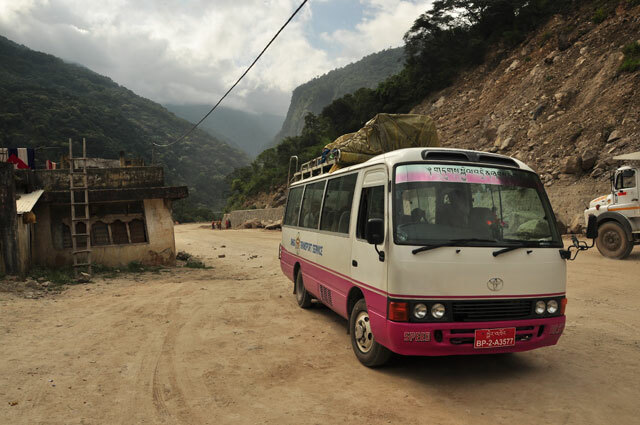 As soon as we reached the bus stand, we found that there was a local bus that was ready to start to Phuentsholing: it was a rickety, run-down bus with torn seats, but we decided to take a chance anyway since there were only 4-5 people sitting inside apart from us. Little did we know that in the next few minutes, the entire bus would be stuffed to the brim with the local village people! For the next 6 hours, we were stuck in a bus that literally had people falling on top of each other, and us. To make things worse, the weather was very sultry, and the condition of the roads was deplorable (especially the last 2-hour stretch!). We heaved a sigh of relief when we finally reached Phuentsholing at around 8:45 PM. The entry to this border town is marked by a nondescript Tibetan-styled gate; one side of it is India and the other side is Bhutan. We checked into our rooms at Hotel Sinchula and rested for half an hour. When we headed out for dinner at around 9:30 PM, we realised that the restaurant in the hotel was closed, and in fact, the entire city had shut down! One of the locals asked us to “Go have dinner in India” – it took me a moment to realise that he meant crossing the border gate. So we informed the security guard at the gate, crossed over to India for dinner, and then came back to Bhutan. Go to the local bus stand and find out the frequency and timings of the buses to Thimphu (we found that there are regular buses every 30 minutes, but we didn’t book in advance because we weren’t sure how long it would take to complete the immigration formalities). Head to the Immigrations office at 9:00 AM and submit an application form for the entry permits, along with 1 passport-size photograph and 1 photocopy of the passport. A visa is not required for Indian and Chinese nationals. Have breakfast at a nearby restaurant. Get a local Bhutan prepaid SIM card (we bought a Tashi Cell prepaid SIM from the Tashi Complex). Go back to the Immigrations office and collect our entry permits. 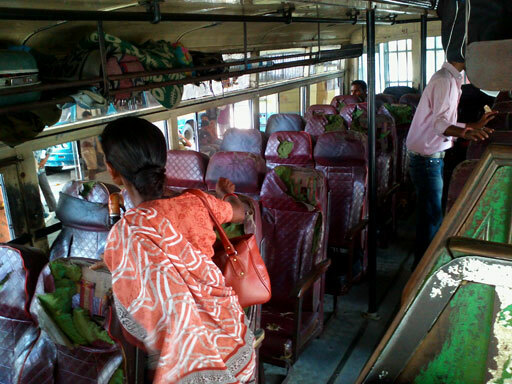 Check out of the hotel, pick up our bags and head to the bus stand. We managed to complete all the above activities just in time to catch the afternoon bus – it started as soon as we got in! The bus was neat, comfortable, and most importantly, not crowded. And as we rapidly gained altitude, it started to get cooler, and we began to see dense clouds sweeping over the verdant hills. What a contrast to our earlier ride from Siliguri to Phuentsholing! We were quite ecstatic as it was apparent now that the trip was only going to get better! We finally arrived in Thimphu late in the evening and checked into Hotel Tandin, located on the main city street, Norzin Lam. We freshened up, and headed out for a short stroll around the city. After checking out all the colorful local textile and handicraft stores, we were eager to try out some authentic Bhutanese cuisine for dinner! We spotted this tiny place called Shelse Restaurant diagonally opposite the Handicraft Emporium, and decided to give it a try. Sonam (the manager of the restaurant) was very friendly, and patiently explained all the dishes listed on the menu to us. 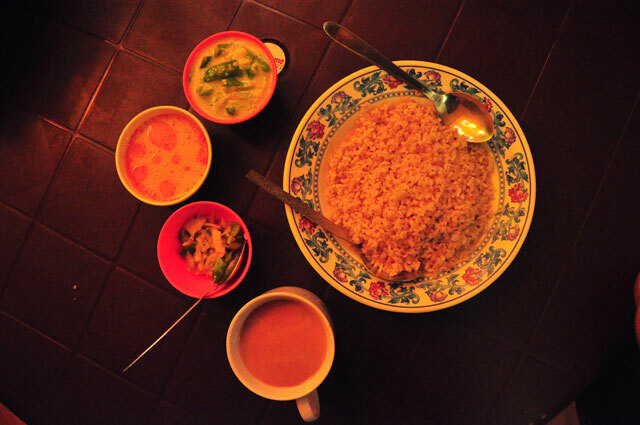 We had Bhutanese Red Rice with Ema Datshi (sliced green chillies in hot cheese), a bowl of soup, and vegetable salad. We tried out some of the beverages too – Suja (butter tea, tasted bad! ), Daaw (a sour, over-fermented version of our Lassi) and Changkey (rice wine). Memorial Chorten – This is a prominent landmark in the city. It is a very peaceful place, and one can see people engaged in silent prayer as they circumambulate the central white structure, crowned with a golden spire. We also visited another old temple later in the day, but I forget its name. Buddha Point – This is a massive 169 ft statue of the Shakyamuni Buddha. It is still under construction, so we were only allowed to view it from a distance. Nevertheless, this is a great spot to shoot pictures of the Thimphu valley. BBS (Bhutan Broadcasting Station) Tower – This is another great spot to get a view of the entire Thimphu valley. Motithang Takin Preserve – The Takin is the national animal of Bhutan, having the head of a goat and the body of a cow. I have never quite seen an animal like this before – they’re big, lazy and quite ugly! Folk Heritage Museum – This is a place where one gets a glimpse of the traditional Bhutanese village life during the 16th and 17th century. There is also an attached restaurant that serves organic food. 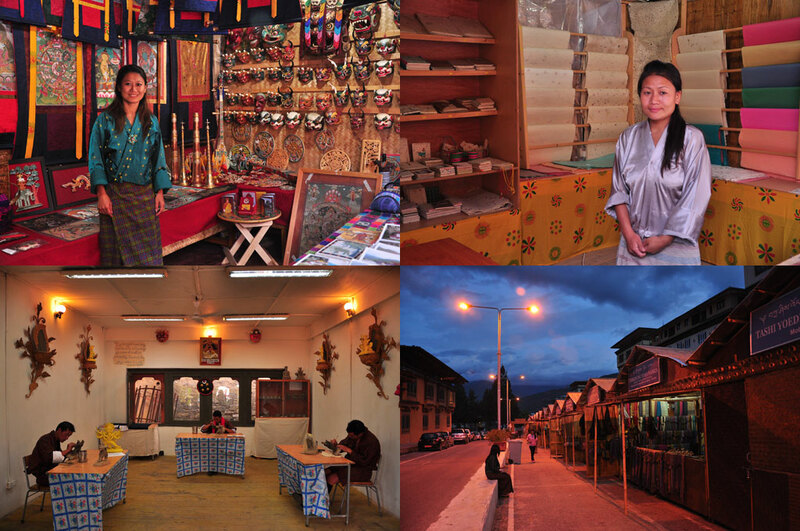 Zorig Chusum Art & Crafts School – The term ‘Zorig Chusum‘ refers to the 13 ancient art forms that continue to thrive in Bhutan today, including painting, sculpture, carving and embroidery. We had a nice time interacting with the students, and watching them at work. Thimphu is a small city, so we were able to cover all the sightseeing spots by late afternoon. We headed back to our hotel for some well needed rest. Later in the evening, we stepped out again for a 2.5-hour walk around the city. 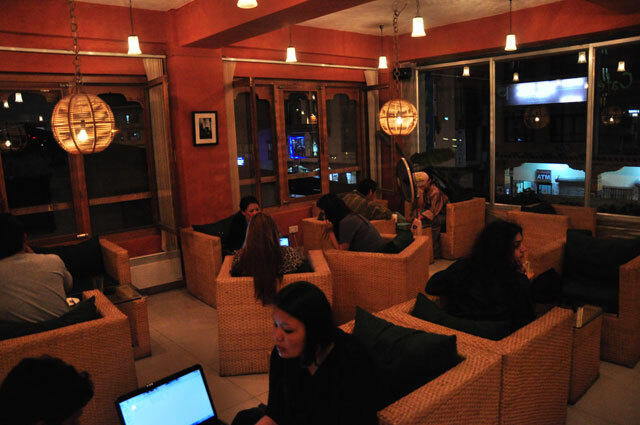 We visited all the colorful art/craft and souvenir stalls, and finally had a light dinner at Ambient Cafe – this is one of the few upscale places we visited in Thimphu – the snack items were great, and so was the ambience! We checked out of our hotel at Thimphu at 6:30 AM and started by taxi to Paro. 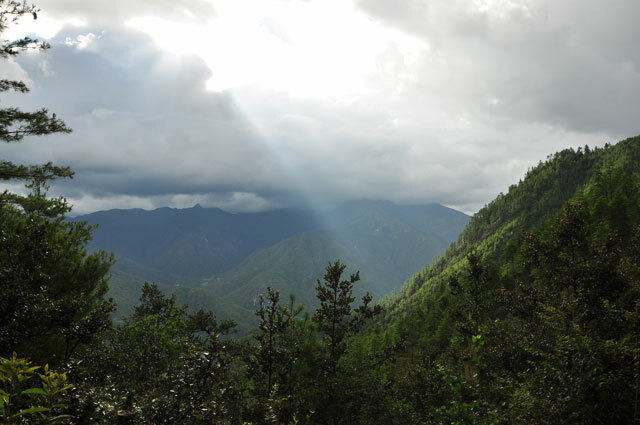 The sun was already peeping out, and the landscape had changed completely from the previous day – it was as if we were visiting Bhutan in another season altogether! The drive was scenic, and we stopped at quite a few places to take pictures. 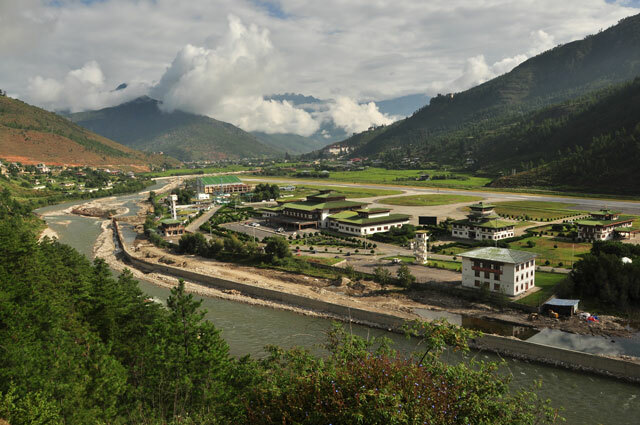 The bird’s eye view of Paro International Airport in particular, was absolutely stunning! Unfortunately, we couldn’t stay there long enough to watch a flight land/take-off. We dropped off our bags at Hotel Phunsum, had a quick breakfast at a nearby restaurant and drove to the base of the Tiger’s Nest – this is a monastery that is perched on a cliff at an altitude of around 10,240 ft. A trek to this spot involves a climb of around 3,000 ft from the base of the Paro valley, and that was exactly what we planned to do! There is a small cafeteria set up at the half-way point (the prices are exorbitant though – a cup of tea costs Rs. 80! ), and you can get a clear view of the Tiger’s Nest from here. Most people stop after reaching this point. The more enthusiastic lot trek up another hour until they reach the highest point of the trek (10,629 ft), marked by a red flag. The last part of the trek is the steepest and most difficult – in order to traverse to the other rock face and reach the actual temple complex, you have walk down a long flight of stairs, cross a bridge and then climb up another long flight of stairs. We happened to meet photojournalist Karl Grobl at the half-way point – he was scouting locations in Bhutan for his upcoming photography tour in October. We had a nice, long chat with him for around 40 mins and then continued on our upward climb. We stopped at several places to take pictures (and to rest, of course), and after 4.5 hrs, we finally made it all the way to the top! We were welcomed by the friendly security personnel deputed there, and were even offered apples to eat. We deposited our belongings – camera, phone, backpack etc. – at the counter outside and entered the temple complex. After visiting all the small temples there, we sat for a while and enjoyed the serene landscape one last time before re-tracing our path to the base of the Paro valley. 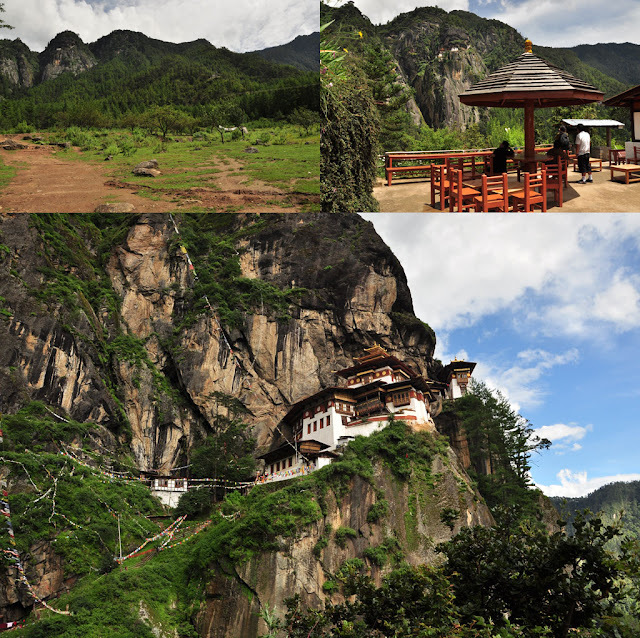 It took us around 2 hours to get back down, and by that time, all the Dzongs and other sightseeing spots were closed. We had no regrets though, because we had just completed one of the longest and most beautiful treks of our lives! On the way back to the hotel, we had an engaging conversation with our taxi driver Kelden about his family, the Bhutanese education system, the wedding rituals and the Bhutanese way of life in general. When we reached the hotel, we surprised him with a teddy bear for his 4-year old daughter – it was her birthday the following day. He was very grateful for the gift, and wished us well for the rest of our trip. We had dinner at Hotel Pejorling and returned to our hotel rooms for a good night’s rest. But sadly, I didn’t get much sleep that night because of mosquitoes and some dogs that were barking outside all through the night. Mr. Kesang, the owner of Hotel Phunsum cooked us breakfast in the morning and dropped us at the bus stand in his personal vehicle. We happened to be the only guests in the hotel, and hence the VIP treatment! 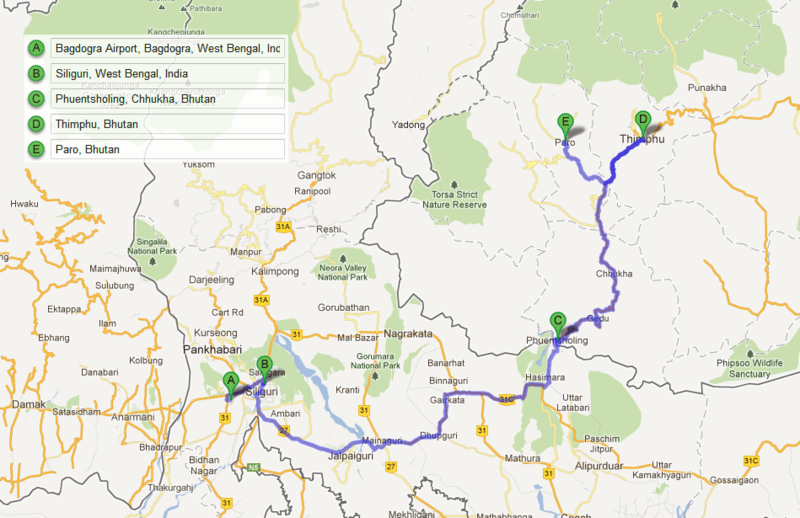 Having reached Phuentsholing by 3:00 PM, we decided that it was best to travel to Siliguri the same day. This way, we would avoid the tension of having to travel 6 hours from Phuentsholing to Bagdogra Airport early in the morning. 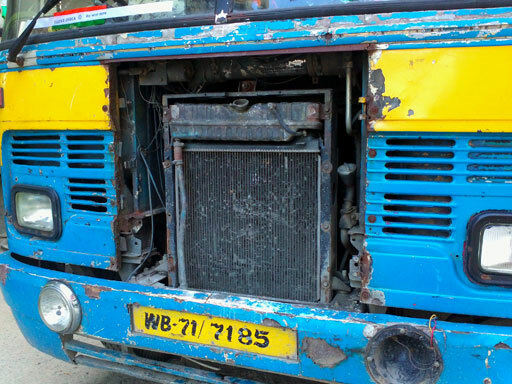 Also, we didn’t want to experience the unpleasant local bus ride again (once was more than enough! 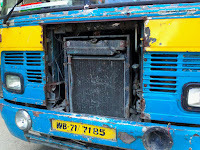 ), so we hired a comfortable A/C taxi instead. 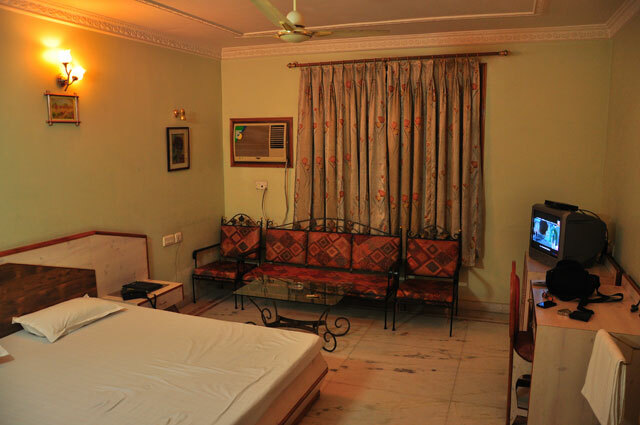 By 9:00 PM we reached the Mittal Bus Stand in Siliguri and checked into Hotel Tourist Inn located just a few minutes away from the bus stand. It was a calm, lazy morning. We literally had nothing on the itinerary for the day, except reaching the airport by 1:30 PM. So after spending some time at a nearby cafe late in the morning, we packed up our bags and headed to the airport which was just half an hour away. And before we knew it, we were on our return flight to Hyderabad! Below is a short video I put together with some glimpses from the trip – mind you, I shot it with my cell phone (LG Optimus P970), so it obviously does not do justice to the beauty of the place! If you happen to be an Indian national planning a budget trip to Bhutan yourself, below are some travel and accommodation details that might help you. I have mentioned all rates in Indian Rupees, since the Indian currency is widely accepted in Bhutan and is equivalent to the Bhutanese Ngultrum (1 BTN = 1 INR).